When you're getting the little ones dressed up with their Easter baskets in hand, don't head to Stryker Park for the Community Easter Egg Hunt. Instead, head down to the Crook County Fairgrounds, the new location for the Kiwanis-sponsored event. 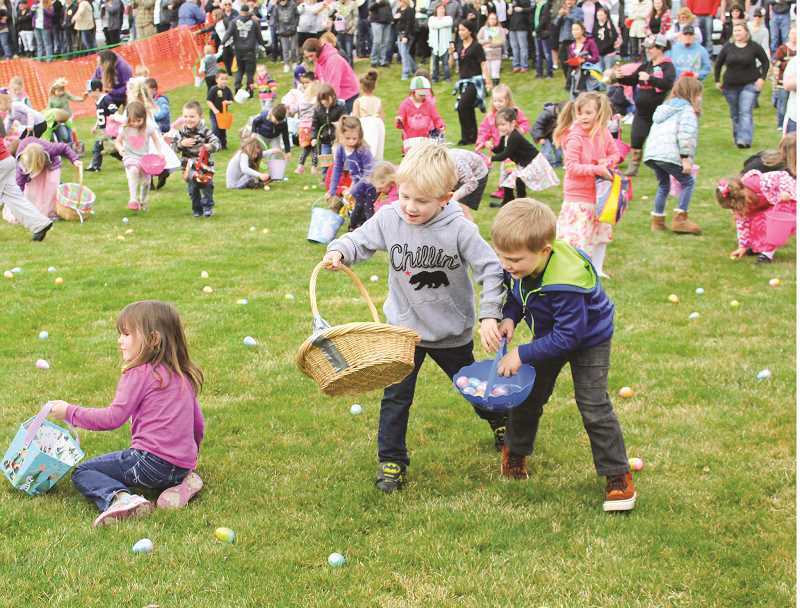 Kiwanis Club of Prineville Vice President Ray Austin, who is in charge of the event, said they decided to move the annual Kiwanis Community Easter Egg Hunt to the fairgrounds, away from the Kiwanis splash pad construction at Stryker Park. "Easter egg hunts, family time — I'm a big believer in traditions," Austin said. "Being able to provide a venue that is at no cost to the community, to bring their kids out and continue a tradition, is a big deal, and it means a lot to me to make sure that we're able to provide that to Prineville and Crook County." A fire engine air horn will signal the start of the hunt at 10 a.m. Saturday, April 20 in the grassy area between the covered pavilion and the Grizzly Mountain Pavilion. But, you might want to get there early for the pancake breakfast. The Prineville Volunteer Fire Company will be serving pancakes, sausage, coffee and juice beginning at 8 a.m. in the covered pavilion. The pancake breakfast is a fundraiser for the group and costs $5 per person, $20 for a family of four or more, and free for children 6 and younger. Families with children 10 and younger may also begin registering for the Easter egg hunt at 8 a.m.
Those who register will receive a raffle ticket. ProLine Fabrication donated the funding for two tricycles and six bicycles, which will be given away at the end of the event. A boy and a girl in each of the four age groups will win the new wheels. Children in each age group will hunt in their designated area — all hunts begin at 10 a.m. Age groups are 2 and younger, 3 to 5, 6 to 8, and 9 to 10. Austin is planning for 500 children. They will hunt for 6,000 candy-filled eggs, which Country Financial Ray Austin Agency donated. He ordered the eggs from the same company they have used in years past. The company hires people with special needs to fill the plastic eggs with various assortments of non-allergenic candies. When the little ones are not hunting eggs, they can pay a visit to the Easter Bunny and explore inside a Crook County Fire and Rescue fire engine. Austin said that while the Kiwanis Club puts on this event, they do accept community business partner donations. "There are ongoing costs associated with producing this event," Austin said, adding that they hope to eventually be able to add more prizes, activities and gifts for the children. He enjoys heading up the long-standing Prineville Easter tradition and says he likes being able to offer families a safe place to come and have a good time. "It pulls back to our Kiwanis goal and mission of serving the youth in our community," he said. Registration opens at 8 a.m., and the hunt begins at 10 a.m. Saturday, April 20 at the Crook County Fairgrounds, in the grassy area between the covered pavilion and Grizzly Mountain Pavilion. Prineville Volunteer Fire Company will serve a pancake breakfast beginning at 8 a.m. Cost is $5 per person, $20 for a family of four or more, and free for children 6 and younger.